Seeing is believing when it comes to the view from Hydeaway Retreat Beach House. Set just a few steps back from the white sands of Hydeaway beach, this three-bedroom holiday home boasts breathtaking ocean outlooks and an ocean sunset unique to Hydeaway Bay. Hydeaway Retreat Beach House is the perfect holiday home for families or small groups of up to nine guests maximum. 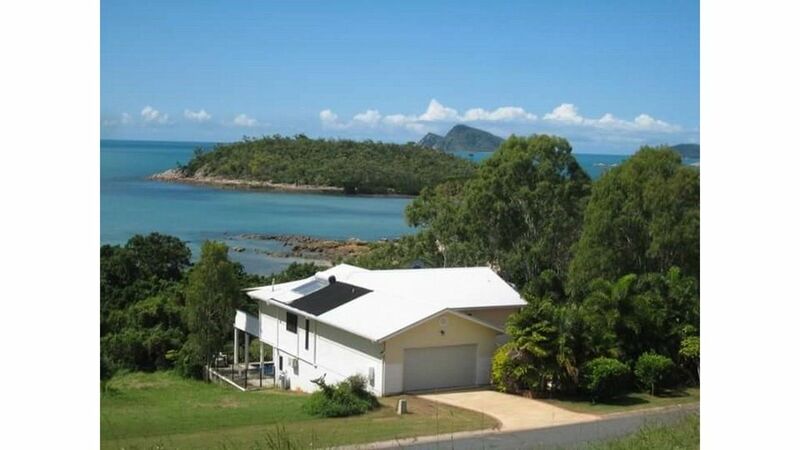 Located in the heart of Hydeaway Bay, just a 40-minute drive from Airlie Beach, Hydeaway Retreat Beach House offers privacy and serenity that is unmatched. Fully air-conditioned for guest comfort, the layout includes a king-size master bedroom, with a queen bed in the second bedroom and three king singles downstairs. Two of the king singles can be pushed together and made up as a king bed on request, and there are also two trundle beds. The fully equipped kitchen is perfect for a home-cooked family meal, or if you prefer to take a night off you can head to one of the local beachfront restaurants. The house has its own private pool on the deck, from where you can also enjoy views over the Whitsundays Gloucester Islands group. The walkway to the beach is just steps away and the Hydeaway Bay boat ramp and associated water sports are also only a short stroll. There is ample car and boat parking at the property. The nightly rate is based on four guests. Each additional guest is $10 per person per night for linen supply purposes. Amazing property. Very well equipped.Very clean. Beautiful ocean views and easy beach access. Beautiful location. Direct access to beach and children's playground. Coffee pod machine and pods, plus sugar, assorted teas and instant coffee. The listing needs upgrading to include everything available and I don't feel the current photos do this property justice. ATTENTION OWNERS! If you would like to contact me, pls do so. I'll give you more feedback. Thank you for your wonderful review of Hydeaway Retreat Beach House, we are delighted to hear you enjoyed your stay. We are certainly looking into getting new photos and appreciate the feedback. We look forward to welcoming you back to The Whitsundays in the future. What a great place to stay. We had a very relaxing holiday, the house was very well appointed and had everything you could possibly want and more. I would not hesitate to recommend this property. I am certainly looking forward to my next stay. Fantastic views, lovely house well equipped with all you need for your stay. Pool is an added bonus. The beach is just steps away. Would definitely return. From the moment we arrived, it was instant relaxation. Very well appointed, comfortable accommodation You've thought of everything. We will return again & again. Thank you for sharing your home.